I had to put my 3 lane track build down for awhile due to time constraints. I'm ready to get back to it and have until Friday to make a key decision. Do I keep the two lanes I've done or do I start all over? The current track has two main problems. The first is probably not fixable and we'll ignore it. It's really my own perfectionist attitude and not a show stopper. The second though might be. When I put 13v on the track and put an SG+ on it, the car clearly "stutters" its way around occasionally stopping completely. 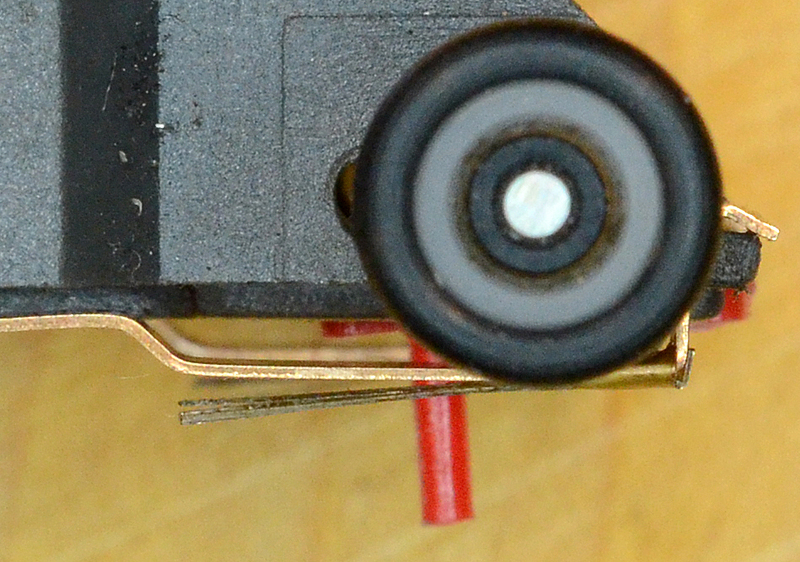 The guide slot itself seems clear and smooth so my guess is a problem with the power rails. I put a volt meter on the track in sections where the car came to a total stop and at least on the meter the voltage is good, however when I rubbed the metal points of the meter on the braid it became visibly "shinier" which makes me think I removed something. Anyway, any suggestions on how to troubleshoot this? Oh, the glue used was an Elmers Wood glue diluted a little bit in water if that makes any kind of difference. If it's been sitting, there's a thin layer of oxidation on the braid. Clean it. Sure, there might be glue residue, too, but this is common with track that has sat. Professional or otherwise. Try higher voltage, too. Those cars easily run up to 20 volts. The more laps the cars make, the cleaner the rails get. What's a good cleaning method? I think I have INox among other things lying around. With 1/32nd tracks most people no longer use glue to stick down the braid, 3M double sided tape is now the preferred method. Ed Bianchi uses carpenter's glue to stick down braid, I have seen that demonstrated and it is quick and easy. If the glue got on the top side of the braid it will have to be removed. If you were to use any sort of solvent the braid might come unstuck. The safest thing to do is to scrape it with something like a butter knife. The braid is tinned so it will not corrode very much, but if the track goes without being used for a few weeks it will need some treatment. We have found that Inox works well. Last edited by RichD; 06-24-2018, 11:24 AM. You say you used Elmer's Wood Glue to hold down your braid. That's good. If there is glue on top of the braid it can be removed without damaging the glue under the braid. What you need is a DULL putty knife. You need a metal knife -- plastic is not going to work well. If your putty knife has sharp edges you will have to 'break' them. A deburring tool is the right tool for this job, but you can sand or grind off the edges. A Dremel tool, a belt sander or a sanding disk chucked into a power drill should make this job easy. If you scrape the top of the braid with your putty knife you might see you are removing some glue. If so, you have a lot of scraping to do. The good news is you'll only have to do this once. If the layer of glue on top of the braid is thin you might be able to remove it with a DAMP sponge. Keep your clothes iron handy, in case you get the underlying glue wet and the braid comes up. You can iron it back down. Set the iron to a medium heat. There will be no damage to the track or the braid. I've done it many times. You'll be good. That's another advantage of using Elmer's Wood Glue. There is one other reason you might be experiencing these issues. 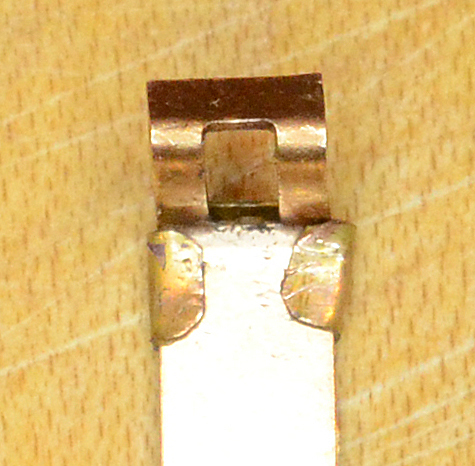 That is if the braid relief you cut is too deep, and the top of the braid is below the surface of the track. That is bad. If I was faced with 'buried' braid I'd rip it up, fill the braid reliefs with Bondo auto body epoxy and recut the braid reliefs to the proper depth. If you've made banked curves or inclines/declines it will be difficult to keep the correct depth. You'd have to flatten out those sections to keep the router depth accurate. Please tell me you didn't bury the braid! I don't believe I buried the braid under the surface. To the touch there's an edge to it (not a big one but there is one), and I did try and use a caliper to make sure the router bit depth was correct before I began. I have a bunch of plastic putty knives but you're saying that's not going to help right? To be clear your suggesting taking a dremel or some such tool over a metal putty knife to dull it before using it to try and scrape anything off the braid? I think I'll try the wet sponge iron first on the parts that are the worst. If that works I may do that over the entire lane and see what happens. Regarding INox, if I remember right the idea was to put a drop or two on each shoe and simply drive the car around. Is that correct? I think I also have CRC32 (ha, that may be a computer science thing), but I can no longer remember why I have that. Good news. With a combination of a wet sponge over the rail, sand paper in the guide slot, and inox on my cars shoes, I was able to get one lane running laps. There was definitely glue on the rail as I was able to rub off something that was not MDF dust after applying the wet sponge, but that alone didn't get the car working. I am still a bit concerned. The worst spot is on the exit of the tracks tightest turn. The car gets through the hair pin with no problem, but at a lower speed of course. It's right after the hair pin on a very low angle turn the car stops. In this direction I still have a hard time running 3-4 laps with out getting stuck. When I change the track direction, I can hit that area a lot faster and then slow down in time for the hair pin. In this direction I ran 20 laps with out any real issues. If it matters I'm running the same SG+ car but now I'm at 22V and actually driving it with a controller. Previously I just set the power to 13V and had it running controller free. Any other ideas on this section? I may repeat what I did tonight in that spot last night, but that's only because I'm out of ideas. Looking at the rail itself it's not obviously messed up in any way. My club races on both railed and braided tracks. 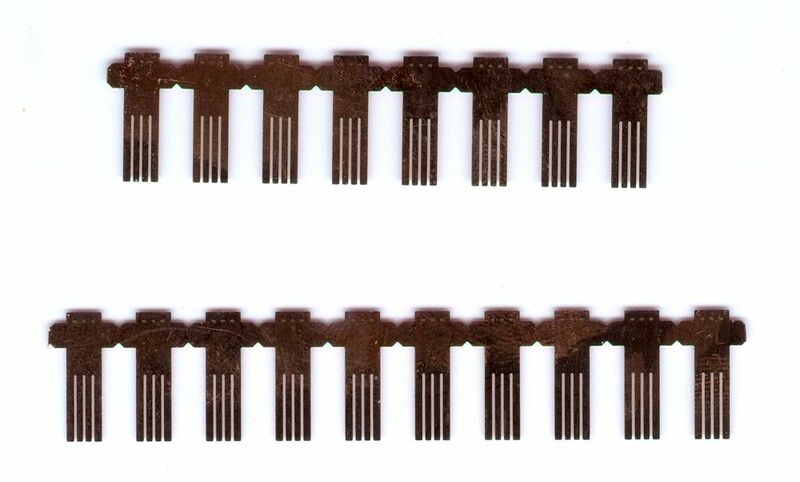 Regular HO cars are made to run on tracks with rails, if you run them on a braided track you will probably have to fuss around with the pickup shoes to be sure that they run flat on the braid. You did say that your braid was slightly raised. My experience has been that you will have more problems with poor contact if the braids are flush with the track surface. Braided pickups work better when your track has braid, if you have not done so you might try using a car with a slide guide. Another thing that has worked for me is the "Braiders" that Ed Bianchi had made. Those clip on regular pickup shoes and will make better contact. Yup. Shoes can be finicky on braid. Must be absolutely riding flat and also be clean. I'm not doubting what you're saying here, but why would one direction work basically flawlessly (all be it at high speed) and the other direction has issues. Same car, same shoes, just a different direction and different speed. If your pickup shoes are making poor contact in a particular spot you can still get through it without stalling if you are going fast enough. You might have to slow more in one direction or possibly there is still a little glue on the braid in that spot. In one direction you may catch the glue but not in the other direction. One other thing you can try. If you have a 1/43rd or 1/32nd car that uses braids for pickups, you can run that on your track to help clean the braids. Don't expect it to clean off much glue, but if there is still a thin film in spots this should help. If you routed 1/8 inch wide slots you'll have no trouble running large-scale cars on your track. If you routed 1/16 inch wide slots you'll need to cut down the width of your guide. And please, if you are using a sponge to clean glue off your braids, just have it damp, not wet. If it is too wet you risk dissolving the glue underneath the braid. I only have a single 1/32 car, but its got no wheels. I use it as a prototype car for the SRMS. So that's a no go. Sponge is definitely damp not wet. I started out very light and never really did much more as things got better pretty quick between everything I did. Short of the braid shoes, I'll just do what I've already done again and see what happens. It still seems really strange to me that now its only one direction. Missed RichD's last post. I take it back about wondering why its only one direction. I'll also try going slower in the direction that works and see what happens. Generally, I dont see glue as a directionally dependent foible, but Lord knows I've been wrong before. IMHO, the condition you describe is a very fractional "unparallelism" between the pick ups and the track contacts; an under-bite if you will. I see it all the time with braided scratchbuilds on my vintage L&J. Sorta the polar opposite of you're conditions. Please bear with me. On a railed track, typically vintage sectional, if the rail height exceeds the available pick up travel; the shoe is pinned against the chassis. It'll make a skkkkkkkkkkkkk sound and the car will scrub off some speed. It's a fairly rare occurrence, who's frequency increases in combination with lowering ride heights, and pick up shoe window restriction. Consider the antithesis of the aforementioned condition. The same can be said about the opposite direction of the pick up travel too. If the shoe bottoms out prematurely on travel, and the rail/braid is fractionally low; the current flow is interrupted. When flipped around in the opposite direction, the shoe with the compromised travel is on the high rail/braid, and the shoe with more travel is on the lower rail/braid. Sight unseen, and the fact that the condition is directional; I'm leaning more towards a set-up issue. Try a less sporty platform, where the pick ups have sufficient bite beyond the front tire profile, and see what you get. I love a good puzzle! Good Luck! Edit: Let the car die in the area in question, in the problem direction. Hold the throttle and push gently on one side or the other until it wakes up. Then check the pick up geometry/travel of that side. Last edited by model murdering; 06-28-2018, 08:06 PM.